Who said after she had a son, "God has taken away my reproach?" IMPORTANT EXPLANATION, READ this at once! It's urgent! 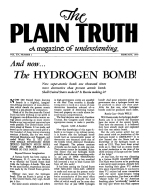 This issue of me PLAIN TRUTH is only 8 pages. We are sending it only to a few thousand co-workers. Many thousands on our mailing list, who have requested The PLAIN TRUTH, will not see it. I want to tell you why. First, I have been under such a tremendous strain, carrying such a crushing load of responsibility, trying to keep up with such a heavy schedule of work, that I have come to the place once again where I am simply worn out - physically and mentally tired - my nerves frayed - and, altho half of the number I have been announcing over the air has been for some time written and set to type, I have been unable to write some of the articles announced. Second, although some of our co-workers have been making real sacrifices to stand loyally behind this great work, many others have become careless and neglectful of the work of God, and there has simply not been enough money to keep on the air and also publish The PLAIN TRUTH. So the magazine was delayed.